One is a rocky satellite whose surface can be as cold as minus 173C. The other is a gas giant that often records temperatures around -145C. But not even these freezing cold temperatures can fan the flames of love, when it comes to Jupiter and the Moon. 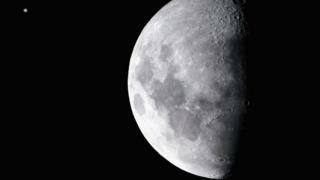 The two will appear to 'kiss' tonight, when the giant planet and crescent moon are less than two degrees apart. The Moon will appear to be right above the giant planet in what astronomers call a "conjunction", which is a meeting or passing of two or more celestial bodies. Your 2019 space calendar! What will be happening? 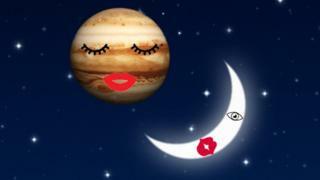 This isn't the first time the Moon and Jupiter have 'kissed' though. In 2013 they appeared to come very close together and from South America it looked like they'd touched. But in other parts of the world it wasn't quite close enough for a proper kiss. Why is the moon kissing Jupiter? Planets' orbits are all slightly different to each other, so they don't follow exact same line. From Earth, it often looks like planets are very close to each other. But while it looks like they're just a few degrees apart, in reality the planets are hundreds of millions of kilometres apart. Where can we see the big kiss? If the skies are clear tonight, there's a good chance we - in the northern hemisphere - will be able to see it. The advice is to get up an hour before sunrise - in the UK, that's around 5.50am - and look out for the crescent moon. Jupiter will be the bright dot nearby. The best kiss-cam view is said to be from the US, where Jupiter will appear just below the Moon. Can you spot Jupiter? It's the tiny white dot in the top left-hand corner. Sadly, it might not appear quite as intimate an encounter from the UK as from other parts of the world, but we should still be able to get a good view! This unusual sight is due to play out over several days, so hopefully you'll get a chance to catch it. If this unlikely romance hasn't tugged at your heart strings, you can always be on the lookout for some other spectacular sights in the starry sky. Saturn and Venus will also be visible - look to the lower-left of the Moon for Saturn, while Venus will be closer to the horizon. What is the dark side, or far side, of the moon? Super blood Moon: What is it? Where are all the women in gaming?